Rabbits have long been considered a quiet pet, and it is true that they are not known for loud noises that bother the neighbors. For the most part, rabbits communicate with others through their body language and muted sounds. The wide variety of sounds that rabbits can make may surprise you, but the longer you're around rabbits, you will notice how they communicate with you vocally. There is a whole list of sounds that you may not have realized rabbits can make because many of them are made at a very low level. Clucking: Rabbit clucking does not resemble the clucking sounds of a chicken—it is a lot quieter. A clucking sound coming from a rabbit means that they are satisfied with what they are nibbling on. Purring: Purring for a rabbit is a lot like purring for a cat in that they both mean "happy and content." However, cats purr using their throat while rabbits make the sound by lightly rubbing their teeth together. It is a very soft sound, but one you will want to listen for. Humming: While all rabbits do it on occasion, most rabbit keepers associate it with an unaltered buck wooing his lady love. Growling: Rabbits certainly can growl and it often precedes a lunge and possibly a bite. If the rabbit feels threatened (even by you), they will have no qualms growling and lunging. Snorting: Snorting can come before or along with growling. Hissing: This sounds exactly the way you think it does. A hiss is used to ward off other rabbits. Whining or whimpering: Rabbits will whine or whimper if they do not want to be handled. You may hear it particularly from a pregnant doe that has been put into a cage with another rabbit (especially a buck). The whimper is a protest to the environment in which they find themselves. This might include an unwanted cagemate or in the case of a pregnant doe, a sign that they are not interested in a buck's advances. Foot stomping or thumping: When rabbits loudly stamp their back feet, it usually means they are nervous and afraid. It could indicate that the rabbit hears a strange sound and thinks a predator is en route. Stomping lets everyone in the vicinity know that something bad is coming. This behavior is very common among free-roaming rabbits who want to inform others of a potential attack. Teeth grinding: The sound of a rabbit grinding its teeth is nearly unmistakable. It is hard to confuse it with purring even though it is made the same way. 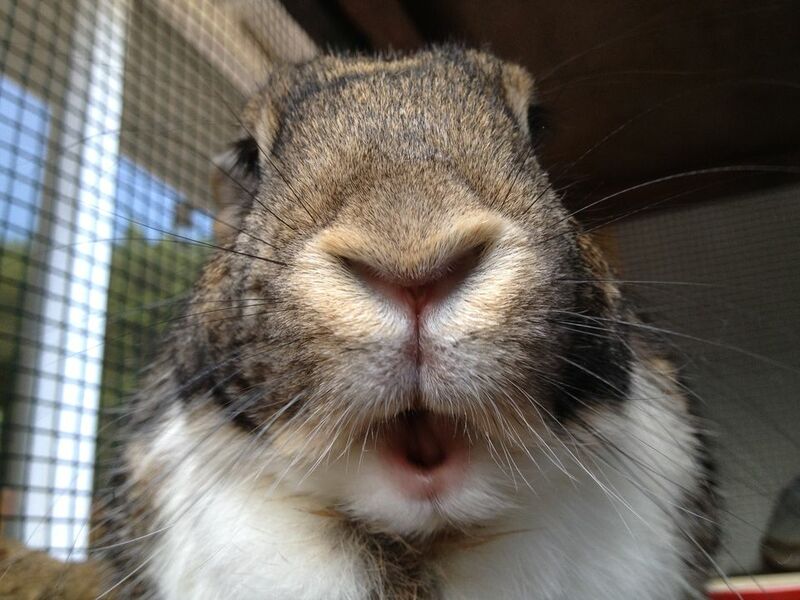 If your rabbit is grinding its teeth, they are in a lot of pain and need medical attention. Screaming: The sound of a rabbit screaming will send chills down your spine for two reasons. First, it sounds eerily close to a terrified child. Second, rabbits only scream when a predator is chasing them down or they are dying. It is never a false alarm when a rabbit screams. Why Do Rabbits Eat Their Own Poop?